Microsoft Windows 7, Windows XP and Windows Vista operating systems have so many internal software services that are designed to serve the connected hardware peripherals, drivers and applications. Among the three operating system versions, Windows XP has the least number of services. Some of these services are essential for Windows startup and for the working of its core components. Some others are designed for specific user requirements. For example, the Print Spooler service polls and facilitates the operation of any external print hardware connected to a computer with Windows installed. Those who are not using a printer can turn off of this service to distribute system resources to other services. 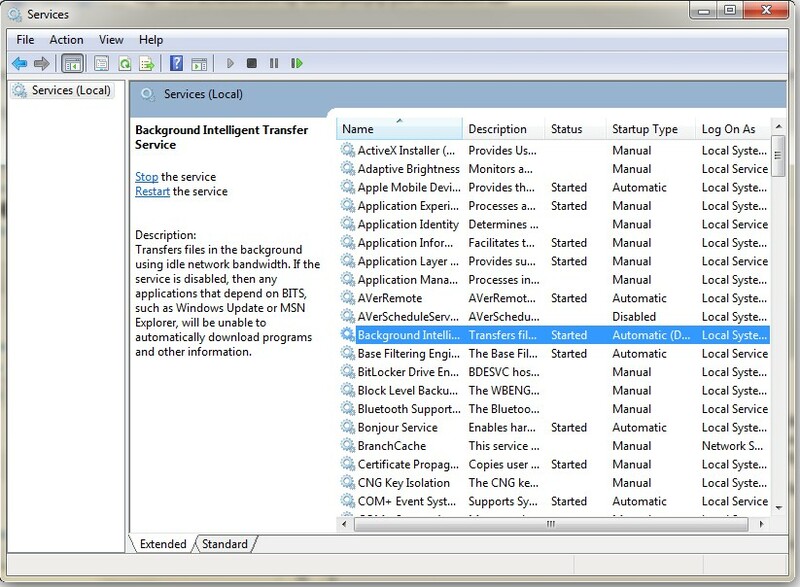 Third party Windows applications also create services for its own Windows components. Here in this article we will show you how can disable unwanted services in Windows and speed up the overall performance of the OS. In Windows, the startup type of any application can be set to three modes, automatic, disabled and manual. A disabled service completely stops its operation and that of the associated programs. Automatic services are the one loads at Windows boot. A manual service loads only when a program or process needs it. You can enable/disable Windows services from the Services section, by typing “services.msc” in Windows Run (Win key+R) window. The operation and use of all the Windows services are described under the extended tab. Double-click on any of the service to open its configuration. The drop down menu near the label- Startup Type can be used to set the service to automatic/manual or disabled mode. The selection of any service is purely based on the hardware, networking or software preferences and needs of the user. Application Experience: The Application Experience service aids old Windows software to work on Windows 7 or Windows Vista, even if the software compatibility mode option is not enabled. Application Identity: This service helps the AppLocker in Windows 7 to identify the list of applications that should be in the blocked list. You can disable this service if AppLocker is not being used. Application Management (AppMgmt): This service is associated with Groups Policy Editor (gpcedit.msc) that helps network administrators/ local users to control various hardware and software settings in Windows. Administrator can install applications remotely through a network using the group policy management tools in Windows server. So when you disable Application Management, it may not be possible for them to remove or install or modify applications using GP feature. ActiveX installer (AxInstSV): It Manages the installation of Microsoft ActiveX controls in internet explorer based browsers, based on Group policy settings. BitLocker Drive Encryption service: Disable if you are not using Microsoft Windows 7 BitLocker application. Background Intelligent Transfer service: It is Used to download automatic updates and perform other background tasks related with data transfer. Print Spooler: We don’t have a printer here. BranchCache: For business networks- set manual/disable. Bluetooth Support service: Useful if you have a USB Bluetooth Dongle, or if you are on a Laptop. Remote Registry: Security hazard – disable it! SSDP recovery: For home networks, if you are using Universal Plug and Play devices. Portable Device Enumerator service: Enable if you want to synchronize music and other content from external devices to Windows media player. Others: Windows Error report, Remote Desktop service, Tablet PC Input service, System Event Notification service, Certificate Propagation, Windows Time and Windows Task Scheduler, Parental controls, Windows Media Player Network Sharing service, Windows search, Windows Media Center scheduler and receiver service, Fax, Windows Biometric service, Smart Card and Media Center Extender service. The above listed is a set of services that we usually disable in our Windows 7 computer with broadband internet connection and without a network administration. You may also find some other services initiated by third party software. Microsoft Office, Antivirus Programs, Apple software, Adobe software, are the most common programs seen creating separate windows services. For a list of services that you can disable on Windows 8, visit forwindows8.com. how do i reinstall them? This is such bad advice that if one decided to follow it their windows would be near unusable. I second that opinion, especially windows update service, you DO NOT want to disable these. immediately remove this list!!! my internet connection gets broken because of u!!! this is a very good advice if you now what you are doing and I sure as hell want to disable windows Update cause the updates cause more problems then they fix. Yes. You really Really REALLY need to know what you’re doing before you go in and disable some of these services. It is good advice for more advanced users, than can pick and choose, but if you go in and turn off everything listed on the site without any other measures, your computer will be fucked. Only morons take advice without thinking, then flame the person they got it from. But to add on one more thing, superfetch. It’s not as hogging of resources as it was in Vista, but it’s something. Definitely a bad advice, DO NOT FOLLOW IT. However view the list of your services and google about every single one of them. This way you’re going to find out if you really want/need to disable any of services. There’s way too many services but most of them serve good purpose. 2.Don’t set nothing else,only the running services give you free rum as i know RAM is random accces memory 🙂 and read 1 per 1 the running services and then stop what you want. I don’t think much manual tweaking is needed, because they did put quite some intelligence in Windows 7 and the way how Services are started. There are no services being disabled here that will mess up your windows 7 installation. Look at each of the services, they are all not needed for a home pc. Personally I like themes, so I keep it running. Windows Updates are NOT necessary by the way. Any services that Windows finds absolutley necessary cannot be disabled and windows will tell you. No, your internet connection broke BECAUSE OF YOU!! This list represents the views and experiences of the POSTER – not you! It is YOUR responsibility to check what YOU are doing on YOUR computer!!! If the article said “drive your car into the wall at 80mph and all will be fine” would you have followed the advice blindly?? nice list of advice, as stated above if your not sure don’t play with it. the only one I would choose disable, are the remote reg, and print spooler if you dont have a printer hooked up. and a few others but as I said if you dont know what you doing don’t screw with it. This is one of those articles that fall into the “If you are knowledgeable enough to use it, you don’t need to read about it.” category. 1) Look at each running service. 3) If no, do research until you can answer “yes” or LEAVE IT ALONE! 4) Repeat the process for each service. Tweaking Windows, be it XP, Vista or 7, is always a riskfull undertaking if you don’t have a clue what you are tweaking. It’s true that a large number of services are not needed for most users and Microsoft overdid it a bit. Ofcourse demands of users for improved possebilties and better security are oppossing eachother here. With services it’s good advice that if you are not if it’s safe to disable a service, then set it to manual or just leave it as is. With todays PC systems the differences in speed and usabilaty are minor, because of fast CPU’s and large memory. It’s more like finetuning. Ofcourse there is an alternative way to tweak your services and other PC related issues: use a softwarebased tweakutility. Windows 7 Manager is a good example (for Win7 only ofcourse). Always ask yourself if you need to tweak you system. If everything is working just fine, why mess with it? If it ain’t broken…..